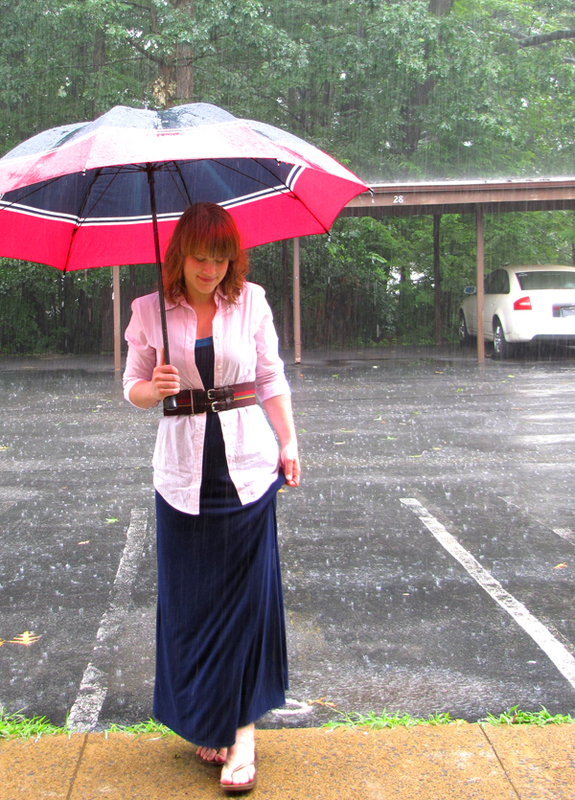 Blue Collar Catwalk: HOLY RAIN, BATMAN! We've had some crazy downpours and thunderstorms all afternoon today. And of course, five minutes after I took these pictures, the sun came out. This racer back maxi dress (Ross, $10) has become my substitute for sweats these days. I had a super productive day today, but it didn't involve a shower until about 3 o'clock. I had to go to a WW meeting, so I needed to look pulled together, but with the ridiculous rain, I also needed to be low maintenance. So, I pulled out the dress and then just starting pulling random things out of my closet to put over it. A pink pin-striped menswear inspired shirt (Gap, $11) and a webbed corset belt (Target, $5) gave me a little coverage and shape. And mark your calendars! I'm wearing flip-flops (Old Navy, $5)! I'm a fully recovered flip-flop addict and can honestly say that these are my ONLY pair. I promise a full disclosure in the near future - for now, I'm still processing it all! Stay tuned for some formal(ish) wear tomorrow! P.S. One of things I'm pursuing is building my invitation/graphic design business. Some of you asked about it the other day. You can check out my new website here. It still needs a little work, but it's getting there! I love this double-buckle belt! You have totally mastered the art of accessorizing the maxi dress; every time you wear one you have a new look. I love them all! My husband lost his job recently, and when we was offered an opportunity 600+ miles away, I quit mine. We moved to a town where we know no one, and I had no opportunities pre-planned out. Being a girl who has worked steadily since I was 15, this was terrifying for me. However, I believed in my husband - he felt this was the right move for his career. We are about 3-4 weeks in and I am loving this place we have moved, the people here are wonderful and I found the perfect opportunity almost right after starting my search. My point here, is that with a little faith, wonderful things blossom. I wish you the best of luck with your new endeavor! Things will start to fall into place ~ and when they do, be ready to grab it with both hands! aww you look so carefree and happy-like you could just be singing in the rain! i love that! I totally did the same thing - quit my day job to actually pursue and enjoy life - a few weeks ago... it's been wonderful. Can I just say how much I freakin' love this outfit?!? You've definitely inspired me to try it out for myself... love love love it! What an nawesome picture in the rain! I LOVETH this outfit. I never would have thought in a million years to pair a button down over a maxi dress. Good luck w/your future career. I wish I was getting married again (to the same man, of course), cuz those invitations are beautiful. That dress is so lovely, and i love the pictures in the rain! Ah...rain, i wish we could get some over here already, it's been so darn hot! Go girl! I wish you all the luck in the world with your new adventure! It will be amazing!Your site so far looks amazing! Good luck on taking the plunge! We started a business in a basement and 12 years later we are a corporation. Just love your posing in the rain! Even the umbrella is a matching accessory. 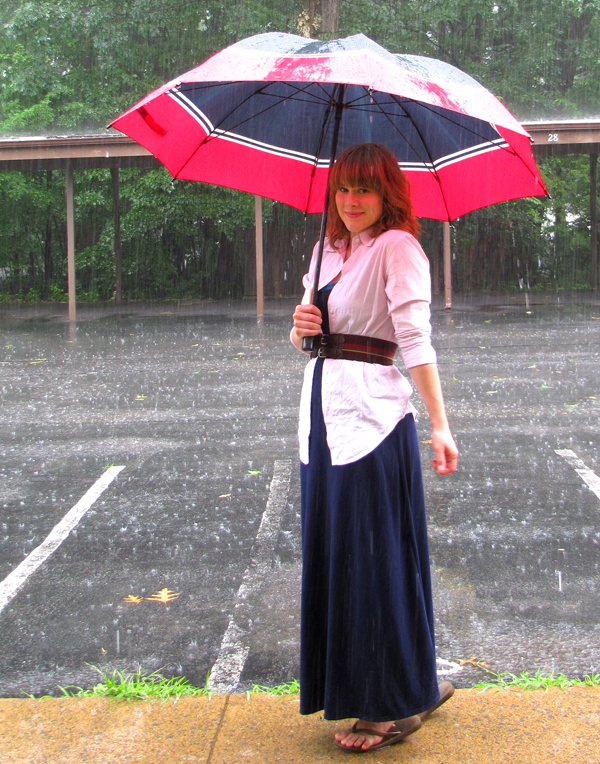 i love the idea of wearing a button down shirt and belt over a long dress and i'm going to steal it! yay! you look chic and comfy. congrats on pursuing your dreams! i agree that it will be well worth it. life is short! do what makes you happy! woot woot! You go girl! What was this job you had before? If its anything like my current job I can definatly relate. Good luck freelancing and getting that off. Its a tough life but people are always looking for that kinda work to be done and can't do it on their own. Our weather has been identical here, crazy downpours last night, I hydroplaned the whole way home...weeeee! Wow- that's pretty exciting! I hope it all works out well for you! That dress is a great staple to have! It's always flattering and is simple enough that you have been able to make so many different looks with it. OK, those pictures are fabulous though and I am GLAD you took them in the rain. That's all kinds of cool. I am so loving that belt! But the target around me never has nice belts.. boo! 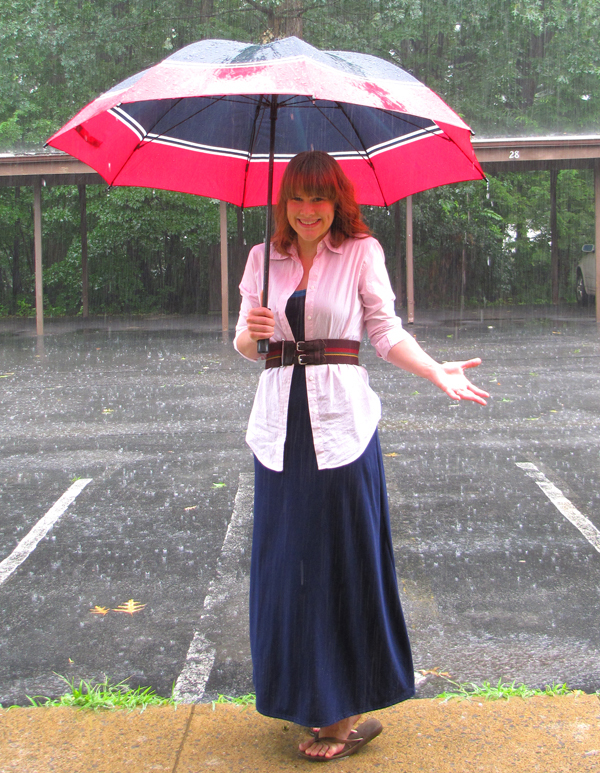 I love your blog because your outfits can handle a rainstorm! I love the belt! I'm having a little belt obsession lately. That is a huge amount of rain! What a fun photo shoot. Love the umbrella! I love rain pictures! And your belt is so cute. Wow... I never would've thought to pair a menswear shirt over a maxi. Genius! And I also quit a crap job so I would have more time to pursue my burgeoning writing and singing careers, and have nooo regrets whatsoever (though I still feel there's not enough time in the day to pursue all my passions!). I wish you luck with your graphic design business! So I adore all of your outfits!! And I totally get the maxi/sweats replacement act! I don't know what I would do if I didn't have my maxi dresses on those days when I just don't want to where anything but sweats! Thanks for all of your inspiration...I even broke out my old demin jacket thanks to you! Hey, guys! Thanks so much for reading Blue Collar Catwalk. Please be aware that this site contains advertising and some contextual links. That means that if you really love something that I'm wearing, link to it from my site and add it to your own closet, I may earn a commission on the sale. Since I'm such a stand-up kind of gal, you can trust that I will only refer you to items that I would buy myself - read: you'll be able to afford them. Post content continues to be 100% me and is not / will never be influenced by advertisers or affiliate marketing. Cool? Cool.